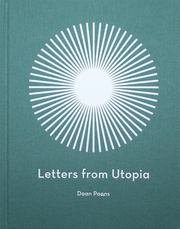 Book Review Letters from Utopia By Daan Paans Reviewed by Sarah Bradley Dutch photographer Daan Paans considers his work documentary, which is strictly true, though I would't immediately think to classify his book Letters from Utopia as such. Paans' results are something more aligned with Rob Hornstra of the Sochi Project, who finds nuanced stories through photographs rather than using photographs to illustrate stories. Letters from Utopia stands as a beautiful and, at least to me, different type of photobook. Text and image are inextricable in the function of this book. Letters from Utopia. Photographs by Daan Paans. The Eriskay Connection, 2013. Hardbound. 160 pp., illustrated throughout, 6x7-1/2". Dutch photographer Daan Paans considers his work documentary, which is strictly true, though I would't immediately think to classify his book Letters from Utopia as such. Paans' results are something more aligned with Rob Hornstra of the Sochi Project, who finds nuanced stories through photographs rather than using photographs to illustrate stories. Letters from Utopia stands as a beautiful and, at least to me, different type of photobook. Text and image are inextricable in the function of this book. While the images do much of the heavy lifting, they don't exactly stand out; none are particularly remarkable over any other. In the pages of this book photographs exist as story elements. While some photographic series' arguably achieve a more powerful state as a photobook, this is the first project I've knowingly encountered where the photographer has intended the book to be the sole final result, to the extent that book pages are reproduced at exhibition. Letters from Utopia, by Daan Paans. Published by The Eriskay Connection, 2013.
Letters from Utopia is an investigation into the practical search for immortality. The book is arranged in a sort of chronology, but also in an order indicating the evolution of human thought on the subject. A collection of five dossiers, each opens with an introduction of the subject before presenting a series of captioned photographs with the occasional snippet of related text sharing the page. Text and image are working in tandem here, setting us on a meticulous path guided by a light authorial voice. The opening chapter displays photographs of the archives of a 19th century Spiritism society who used automatic writing to establish psychic connections to the dead, seeking proof that life continues after the body passes. Consisting almost entirely of photographs of typed and bound séance manuscripts (an attempt to offer the movement scientific legitimacy), we encounter a single human face in a photograph of the archive's founder mounted on the wall of their library. A high-contrast 19th century portrait, he gazes out at the viewer through the reflection of the glass-doored bookcases. Chapter two introduces Aumism, a religion developed in the 1970s by a self-proclaimed immortal charismatic leader who preached the possibility of eternal life through spiritual enlightenment. Paans' images document the cult's now nearly abandoned holy city and its eerie mystical constructions nestled in the French Alps. Following a path of large vajra-like sculptures down fog-covered slopes, the city emerges, human presence notably absent. Historical documents including newspaper clippings and a map with a blast plan for the removal of massive statue of the now deceased holy man close the chapter. Chapter three focuses an originator of Transhumanism, a movement advocating the merging of the human body with technology that believes it to be only a matter of decades away from becoming reality. Presenting a selection of diagrams, manuscript notes and clippings from the papers of the futurist know as FM-2030 (previously, F.M. Esfandiary), the documents give a glimpse at the dreams of a man who passed away before his life's work was realized. The final three pages present a quiz titled "How Immortality Oriented Are You?" It isn't until chapter four that we see the first portraits of people. Focusing on the Cryonics Institute in Michigan, photographs of cryo-preservation equipment, as well as the actual containers in which bodies are interred, are merged with photographs of people waiting for the procedure, a statement from each accompanying their portrait. This is the most personal section of the book, which consequently makes it the most moving; both the statements and photographs creating undeniable reminders of the fragility of humanity and the just as human desire to transcend it. Transitioning from the hope for developments in the future to the frontiers of today, chapter five explores the Life Extension Institute in California who combines enzyme and hormone therapy with the intention of extending the human lifespan to 120 years. Here, photographs of patients, doctors, waiting rooms and laboratories give us a look at the first stages of the potential of these techniques, the power of the enzyme being especially mysterious as it is instrumental in the formation of cancer. We are left with the image of a pill. The book closes with an excerpt from a forthcoming book by Jos de Mul titled Destiny Domesticated, or Five Not-So-Easy Ways to Tame Fate. SARAH BRADLEY is a writer, sculptor, costumer and general maker of things currently living in Santa Fe, NM. Some of her work can be seen on her occasionally updated blog. She has been employed by photo-eye since 2008 and is Editor of photo-eye Blog and Magazine.